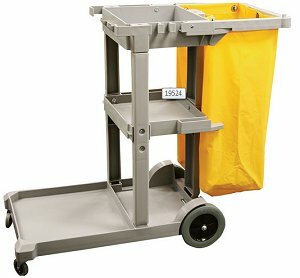 This Gray Janitor Cleaning Cart keeps everything you need to maintain a clean office or workshop in one spot. 3 sturdy shelves hold cleaners and other supplies, the front platform holds your mop bucket and wringer and the side accessory holders keep a hold on your mops and brooms. 25-gal. vinyl garbage bag for waste.